You Care About Social Design. Make Others Care, Too. Essie Justice Group collateral. Image courtesy elefint. The team at elefint explains how to make case studies in the social good space that the general public might actually want to read. Nonprofits and socially minded companies approach us with rich content—often difficult to dissect, but full of answers to some of the most troubling social issues of our time. Behind their complex models and dense data lie hopeful messages and scalable frameworks that can shape a better future. Our challenge is breaking down complex subject matter and making it accessible to the public. We begin our projects by reframing the issue and identifying measurable outcomes that can guide our design process. In essence, we help our clients create a tangible scope of work that can help them reach their longer term organizational goals. But there are always a few challenges to overcome along the way. We called out three we recently had to solve for in order to make end products that non-experts might actually take notice of. Yes, you care about your client and your end product. How do you make others care, too? Collateral created for ACLU of Northern California. Image courtesy elefint. Challenge 1: A tight timeline and a very big goal. As part of a long-term effort to transform the criminal justice system, the ACLU of Northern California seeks to end mass incarceration in the U.S., and has identified district attorneys (DA) as a key player in shaping the criminal justice system. At the time we engaged them as a client, the California primary elections were 13 months away and 56 of the 58 district attorneys in the state were up for re-election. The big question we needed our work to solve for was how to get voters to take notice of—and care—about an elected official who has historically flown under the radar in a small amount of time. Solution: Reframe the issue and create a project roadmap. In an effort to make their umbrella goal of “ending mass incarceration” more achievable, we created a project roadmap that worked back from the June 2018 primaries. Now that we had a set timeframe, we could then create project phases with clear objectives, design deliverables, audiences, and metrics that would keep us on track of meeting our ultimate goal. We knew the campaign messaging and design needed to be powerful, but couldn’t spend the amount of time we would typically take to develop a brand. We kicked off Phase 1 with a 3-day design sprint that expedited the process without sacrificing quality of the resulting Meet Your DA campaign. Challenge 2: Create a moving design from heavy data. After completing a 2-year research study, our client Essie Justice Group found that the incarceration of a loved one or family member resulted in burdening social, emotional, and economic control of millions of women in the United States. The research also carried a message of resilience and power: Fifty-five percent of women, for example, reported that they were more civically engaged during their loved one’s incarceration than before. But rather than emphasizing paralyzing and heavy facts, our goal was to make their data and content actionable. Solution: Establish a positive visual tone that inspires readers to learn, feel hopeful, and take action. In reading through the report content, we could feel the power and humility of the women who shared their stories. We knew that the final print report had to feel more like a keepsake than a research report—something that could elevate Essie’s research and help their community of women’s rights activists feel supported and hopeful about future progress. While we’re always keen on adding information design elements and graphics to draw the viewer in, designing this piece was a process of simplification. The rich material, data, and raw stories didn’t require additional embellishments. Instead, we thought about how our typographic choices, use of photography, and simple grid layout could enhance the friendliness of the piece and let the content speak for itself. Web and print collateral created for Women's Funding Network. Challenge 3: Launching a framework. With a 30-year track record, our client Women’s Funding Network (WFN) was well positioned to create a first-of-its-kind systems change framework that evaluates what makes some women’s foundations more effective than others. Recognizing the limitations of their small and busy team, we saw the need to help them think beyond the final deliverable and adopt a more experimental design approach to reach a wider audience. Solution: Serve as extension of the team. WFN came to us with a set idea of what they needed and wanted. This was the nature of our client/studio relationship up until this point. Once we understood their deeper goals with the framework, we realized a traditional print report (their suggestion) might fall short of their intended goal (wide adoption of their framework). Because we had an established relationship and had built trust with WFN, we were able to shift the mindset and run a design experiment that pushed everyone to think bigger about the possibilities for this project (like revealing their tool on the mainstage at Clinton Global Initiative’s 2016 annual meeting). While the strategies outlined in the framework were thought-provoking, the stories and data they collected from leading women’s organizations across the country helped personalize it—making it fun to interact with and widely shared among the WFN community. In the for-good space, we’ve found that no two projects are the same and therefore need to be approached with fresh energy, flexibility in process, and an appreciation that clients trust us to make their important work even more impactful. Through our work, we’ve learned that smart design can be the differentiating factor that gets our clients’ work in front of wider audiences. Our clients wear many hats and are often operating on budgets and short timelines—but what we’ve realized is that those constraints should be seen as an opportunity to flex creative muscles, experiment, and produce excellent design. 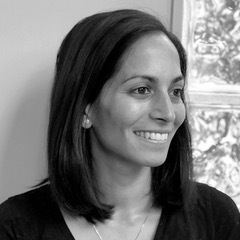 Gopika Setlur is a designer, educator, and founder of elefint, a women run design studio.